Lamb chops have always been one of my favorite meals. When I was growing up, it was a treat to have these for dinner, and it was one of my dad's favorite meals. He always had to have a mint sauce to go along with it—but personally, I'm not a big fan of this sauce. I prefer to use lamb shoulder chops rather than the regular lamb chops for two reasons. 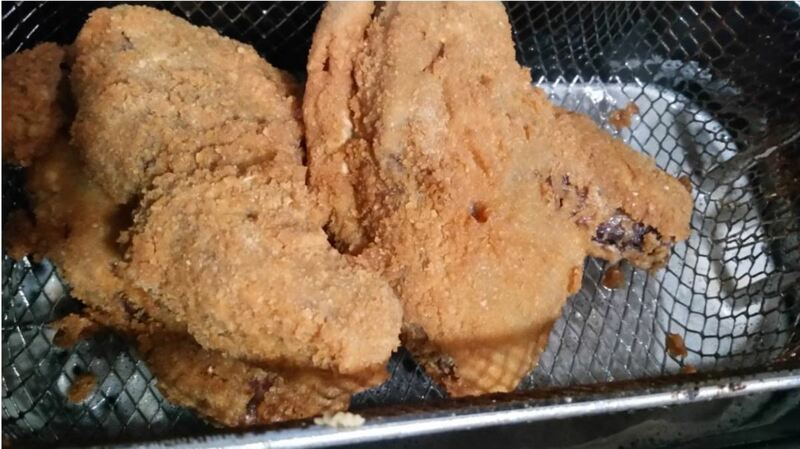 First, the shoulder chops are usually less expensive; and second, you get more meat per chop. 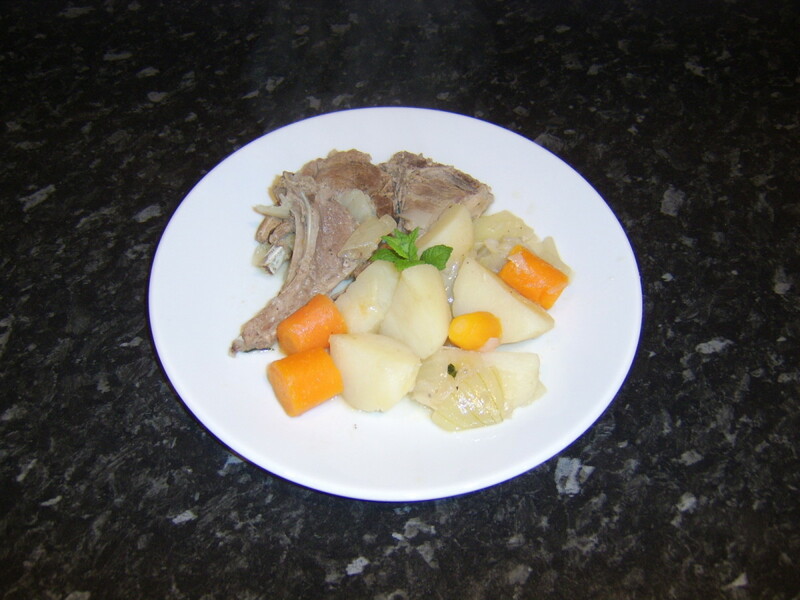 This recipe I am sharing here, however, can be used for either type of chop. In this recipe, we will first marinate the chops and then cook them under the broiler in the oven. Making the lamb marinade: Grate the garlic cloves into a puree. 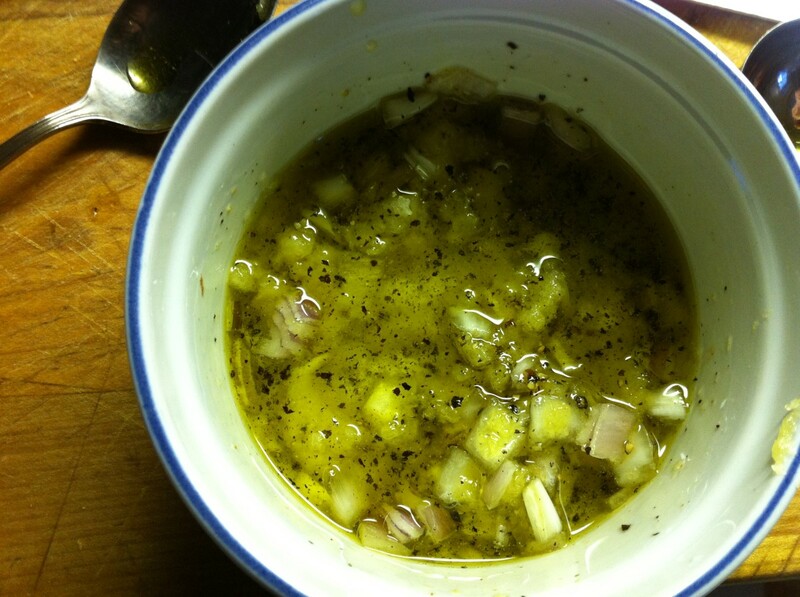 In a small bowl, combine the garlic puree with extra virgin olive oil, chopped shallots, and fresh ground pepper. Whisk all the ingredients together really well. 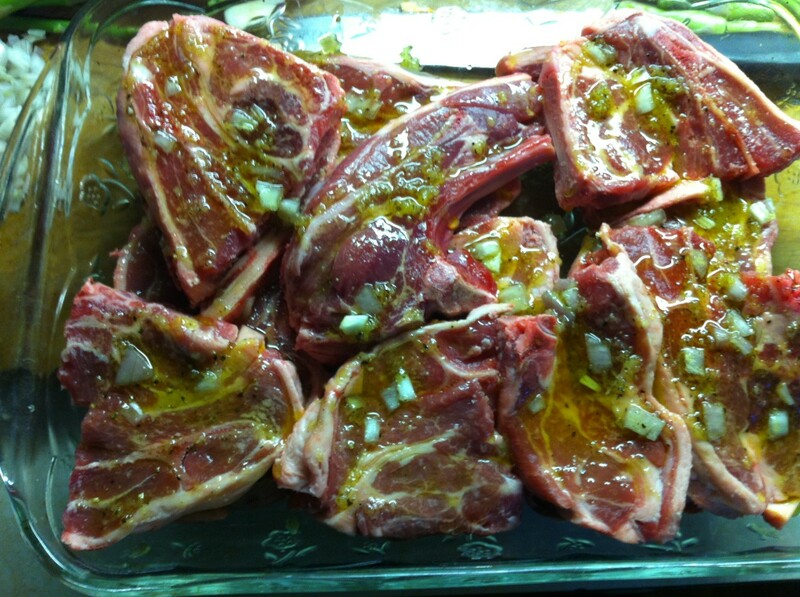 Place the lamb shoulder or lamb chops in a marinating dish and coat both sides of the lamb chops with the marinade. 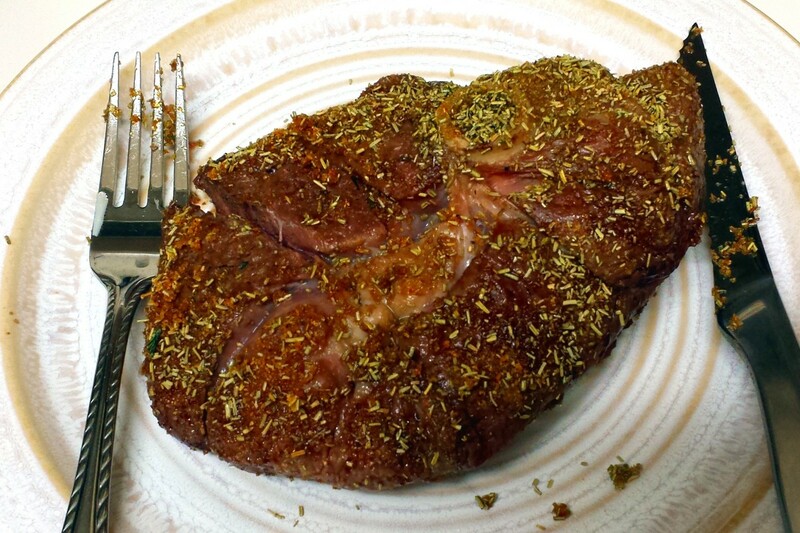 I used a teaspoon to apply the marinade and then with the back of the teaspoon rubbed the marinade into the meat really well. Heat oven to broil with the rack on the second level away from the broiler. Broil for about 8 minutes and turn over and continue to broil for another 8 minutes, or until the internal meat is 160°. Clean and prepare fresh asparagus spears. Place a pot with a steamer basket on the stove with at least an inch of water in the bottom and bring to a boil. 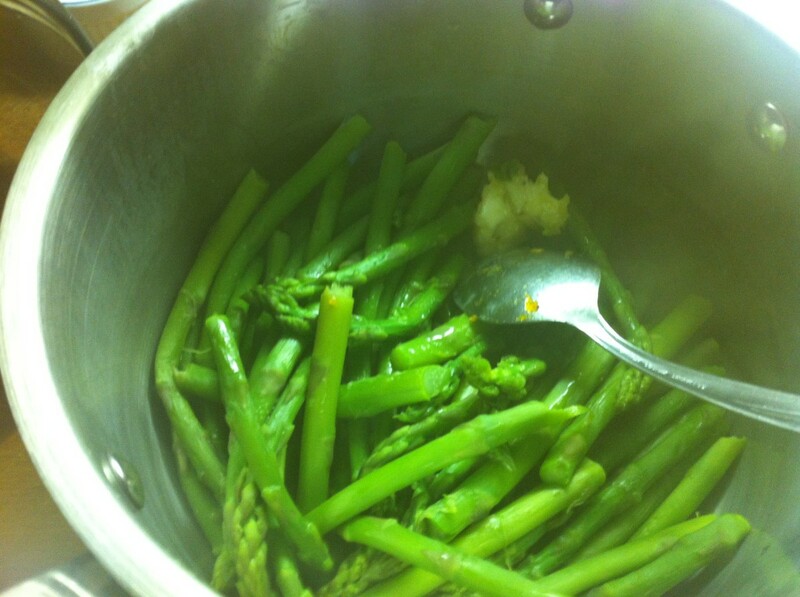 Place the asparagus into the basket and cook for 5-10 minutes. 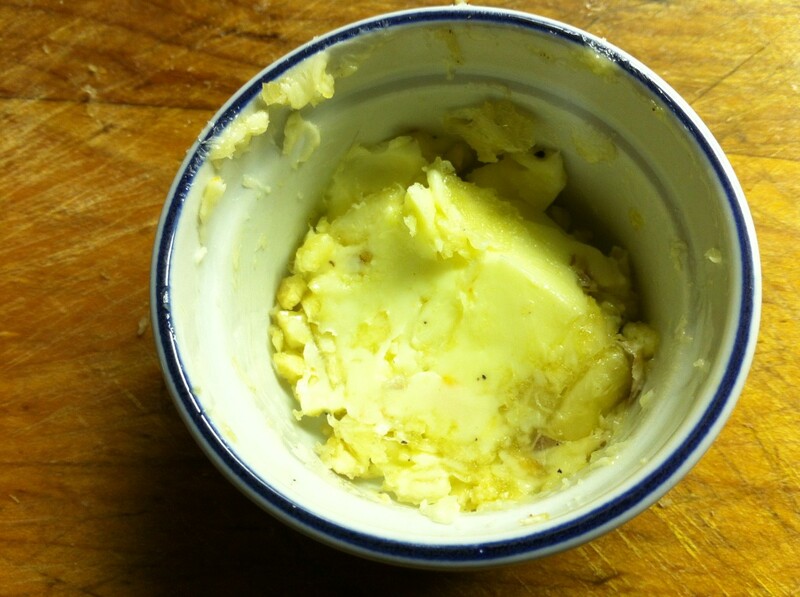 While this is cooking chop 1 garlic clove and mix it into 1 tsp. of butter. Set aside. Remove the asparagus from the steamer basket and put it back into the pot. Add the garlic butter and toss. Cover and let sit until ready to serve. Make the dressing: In a small bowl, combine all dressing ingredients and whisk well. Set aside while preparing the salad. 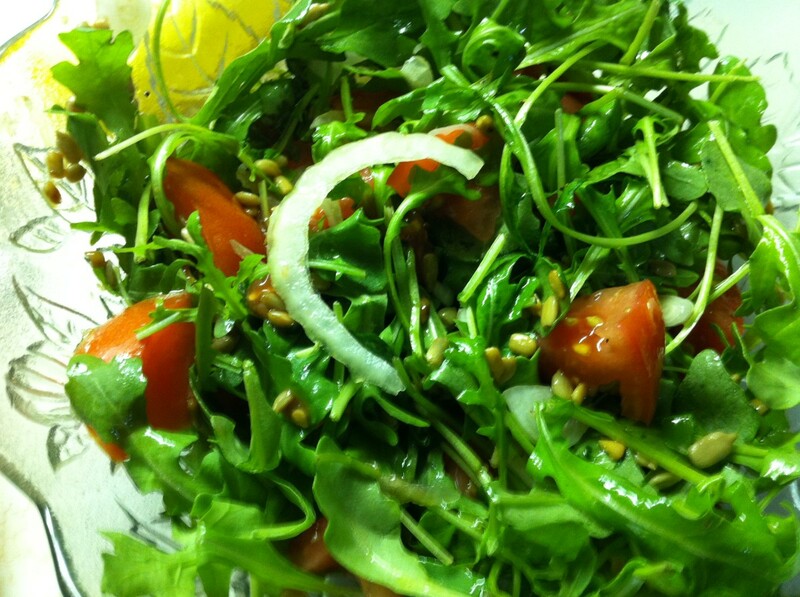 In a salad bowl, combine the arugula, tomato, and onion. Toss with the salad dressing. What type of lamb dish do you prefer? I bought lamb shoulder chops due to the reasonable cost last week. I am going to have to try this one soon. You make it look delish! 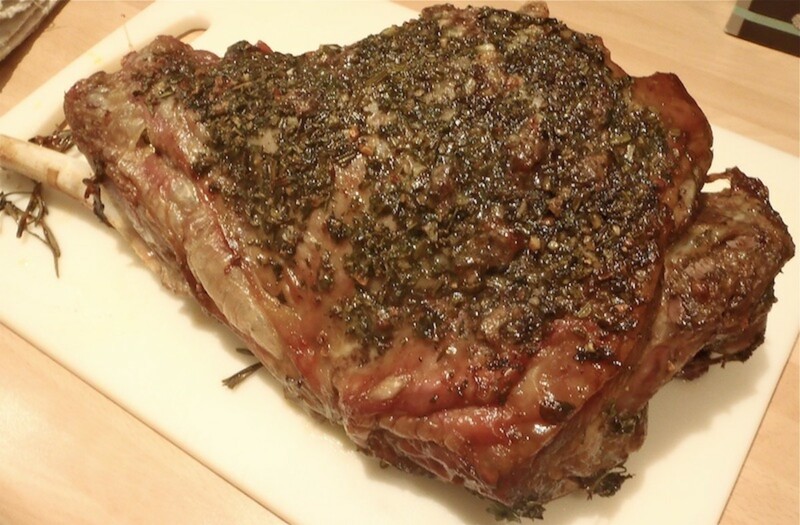 How to - I hope that you enjoy the lamb as much as we do using my recipe. Great recipe for cooking lamb chops. I cook these often but have never marinated them before. I think I will try your recipe next time. My husband and I love lamb. We especially like leg of lamb, but it got so expensive that I can't buy it anymore, so, I get lamb chops instead. Did you every try mint jelly with your lamb? I got that idea from my aunt. It's like having cranberry sauce with turkey. Hi Scott, So nice to see you. The babies are born in the spring so that might be a reason they're scarce? I sure wish that lamb was less pricey. Oh. Em. Gee. I love lamb. Why on earth is it so scarce and expensive? Must find lamb soon. It's okay, there's a lot of us! Take care, Susan. Sorry if I don't thank everyone individually, but .... Thank you ALL so much! This looks delicious! I haven't had lamb chops since I was a kid. Now I want to go out and get some! C ongratulationms on HOTD! I love lamb any way you serve it. It is always great discovering great food hubs. I'm sharing this on my Facebook Writing page. The food in this hub sounds very tasty, Susan. Thank you for sharing the instructions for making a great meal. Congratulations on Hub of the Day! I did the three tier'd share thing the site makes easy to do. I'd love to try this, and more lamb, really. I had some lamb chops not too far back, they were expensive; and I couldn't honestly tell much flavor difference between them and good beef. Lamb isn't real common here in Tejas; and so I'm willing to try ...any other cuts of meat I can get, as I'm a mega carnivore! I have to say, I don't think I have ever had lamb. 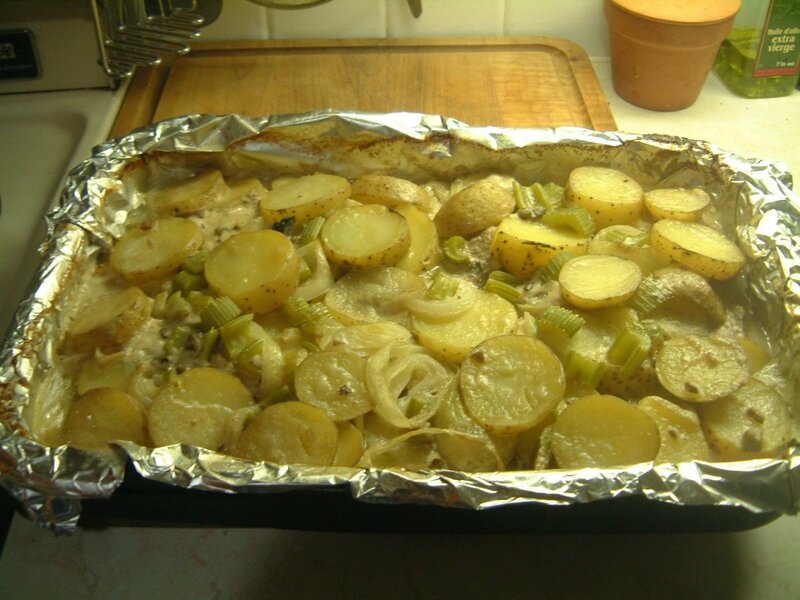 But this looks tasty, and I like the way you laid out this recipe. I love garlic! I also like the sides you added, the table with cooking times based on how rare/well-done you like it, and the visual of what part of the animal goes where. Congrats on winning HOTD, and if I ever see lamb in the store, I would be likely to try out your recipe. Have a great weekend, and I hope you are doing okay. That looks so delicious . I need to try this recipe. Thanks for posting this recipe. Now this looks totally delicious! And congrats on your HOTD! yeah! Wow, I definitely want to share this! Delicious! The photos are spectacular and congratulations on winning Hub of the Day! Much deserved. You've got me hooked. I'm going to follow you so I can impress my guests with fine gourmet cooking. YAYYYYYYYYYYY, congrats on HOTD SZ. Well deserved! Really well done hub with great details!!! When meals come together, lamb is at the center of it all, I am taken. I rarely get to have lamb but when I do it becomes a love affair. Great piece Susan. Congrats on a well deserving Hub! Made my mouth water, cause I love lamb! Voted up etc. and shared. Hey Susan.. when I lived in Turkey.. and Greece this was the most popular thing to eat.. that's where I learn to love Lamb.. especially Lamb chops.. I am getting ready to close out for my second cookbook if you are interested I have one spot left..
Congrats on Hub of The Day. Great looking hub for Lamb Shoulder Chops. Voted up. Congratulations on Hub of the Day! Nice job. I made lamb chops for my grandfather one time with a mint dressing I found somewhere. He loved them. This looks amazing and I am sure will come out as a delicious recipe. Very well presented, with step by step instructions and wonderful pictures. Thanks for sharing the details! This looks yummy...I love lamb chops. 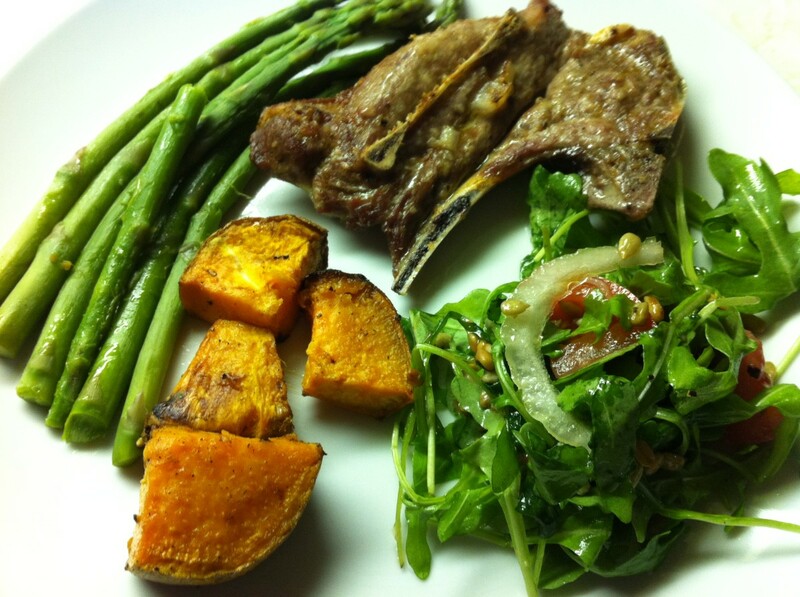 OMG, that photo is mouthwatering delicious and lamb chops are one of my favorite meals. Congrats on earning the HOTD accolade for this beautifully laid out and illustrated hub. This looks delicious. And actually quite healthy too with the right balance of plants, proteins, and carbs. Very nice indeed. I could eat something like this for breakfast, lunch, or dinner. This dish looks like one you would get at a Michelin Star restaurant. You would make Gordon Ramsay proud. Wonderful presentation and congratulations on winning Hub of the Day. This I can do! :) Congrats on your Hub of the Day award and thanks for putting this together for us! 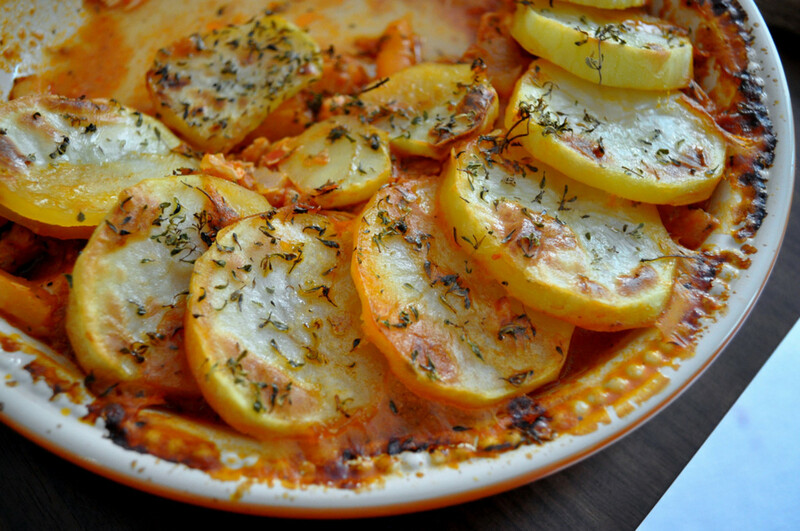 This is a terrific recipe, awesome job! Now I want lamb for breakfast. But the upshot is when I go out shopping today I can buy some lamb. What a beautiful way to present this delicious meat. Coming in to say congrats on your HOTD! Love lamb so will definitely be trying this. Pinned for later use. This is great hub dear! Congrats on the HOTD! I just had to read this when I saw the beautiful presentation in your lead photo! I like the ideas here - will remember them! What a tasty sounding meal. Instructions are awesome. Congratulations! Gorgeous recipe with a favorite meat of mine, love it! 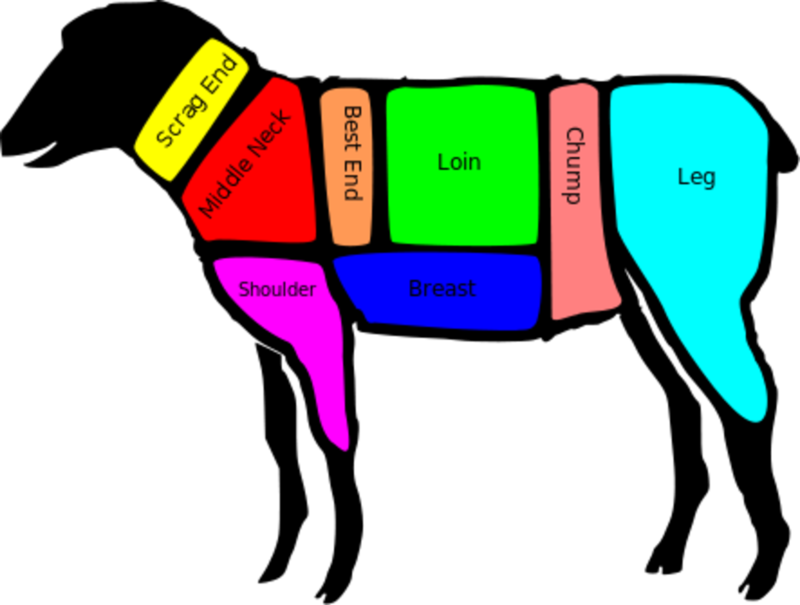 Loved how you showed the map of a lamb too! Great tip about shoulder chops and will look out for them now, congrats on a well deserved HOFD!! Up, useful, awesome, interesting, shared, pinned! You have my mouth watering. Lamb is my favourite and like your Dad I love mint with mine. I agree that shoulder chops are better value than the loin chops. vespawoolf, Some people say that arugula has a peppery taste to it. I find it has a nutty taste. Hope you enjoy it. I also love lamb and really appreciate the tip about the less expensive cut. I'll have to see if shoulder chops are cheaper here in Peru, too. I just saw arugula at the store so I'll have to try this for myself! Thanks! SS, I think you and I should get together and cook a feast. Would love to meet your Dad. Please come cook for me. I'm positive my Dad would love you! tirelesstraveler, I'm grateful that everyone at my house loves lamb no matter whether it be lamb stew, rack of lamb, chops, or leg of lamb. Have a wonderful Easter dinner. Love lamb chops. Thanks for the vegetable pairing ideas. Must have lamb for Easter. Not everyone like lamb, so I have something less expensive for those who don't care for lamb. Sheri, I hope you enjoy lamb as much as I do. J.S. Matthew, So glad that you'll be trying the recipe. I hope you enjoy it as much as we do. Hi Martie, I'm not a mutton fan either. Thanks so much. I have not used lamb very much but will try this. Thanks! torrilynn, Thank you and I hope you enjoy the recipe. RH, Hope you don't have too hard of a time finding it as I'm sure you'd like the chops done this way. Oh, I wish there was a 'yummy' button! This looks absolutely delicious, Susan! I love lamb, but not mutton. GoodLady, Thanks so much and hope that you enjoy the recipe. Sounds like a very yummy and healthy meal. I love your opening pic. What a lovely plate of food! Lamb is a little harder for me to find around here. I suppose it could be because I live in a more rural area? I can get it but I'd have to go to Dierbergs and they don't always carry it either. I am now gonna make it a mission so I can try it! Mary, Pork chops would probably work great with this recipe. Great idea and I'll have to try it with pork chops myself. 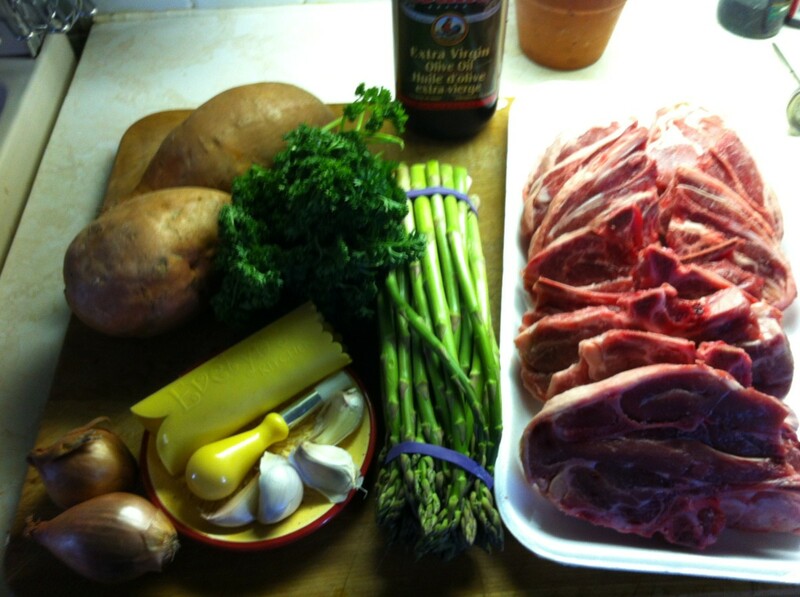 Oh sweet tasting lamb shoulder chops and asparagus in early spring are so delicious, agreed - and your Hub so helpful and so beautiful to look at. Nicely done with the diagram of the parts too! Your marinade sounds delicious. Brava. Pinning in my virtual recipe book, voting and sharing. Ruby, Lamb I think is one of those meats you either love it or you hate it. Susan that looks like a roast lunch made in heaven. All the best combos, lamb, asparragos...yum. All this will go great with gravy and mint sauce. 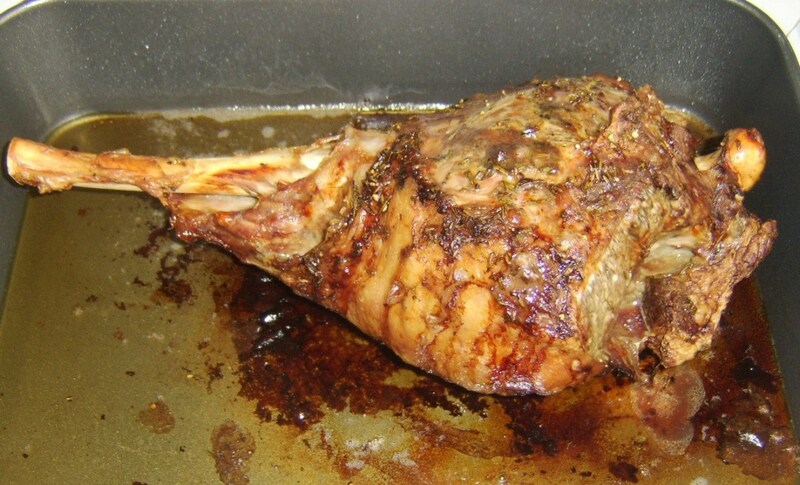 Incredible Photos, lamb is one of my favorite meals any you had just given me a great idea. This recipe, like all of your others is full of great directions and pictures. Unfortunately, like Carol no one here likes lamb. What do you think about substituting pork chops? 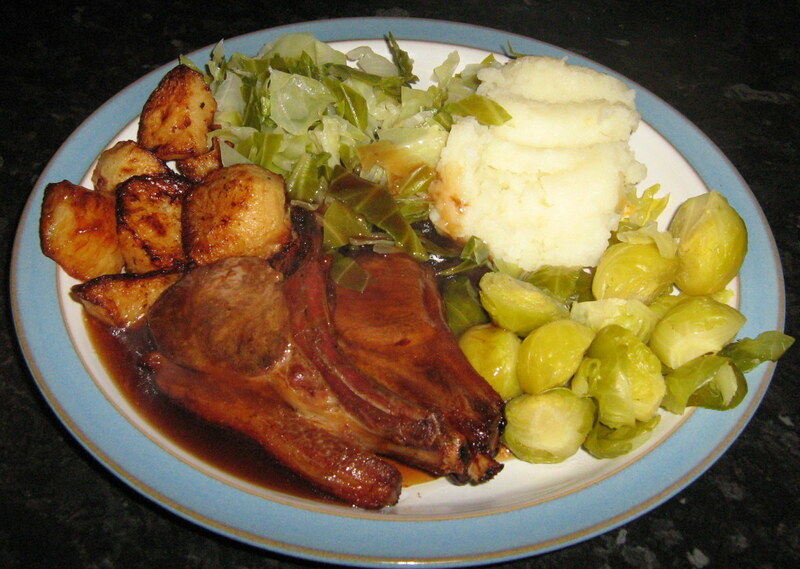 I do like lamb chops (with mint sauce like your Dad), Susan, so perhaps I'll try this delicious looking recipe. But I'll pass on the asparagus. Not one of my favorites. One of my favorite meat dishes is Lamb shoulder chops. Your recipe will be enjoyed one night this coming week. Thanks for the great meal I am going to have. Carol, What a shame that someone in your family doesn't like lamb. I'm happy everyone at my house does. If you do try the recipe let me know if you like it and thanks so much for the votes and pin. I absolutely love Lamb in any form..alas..not the other member of the family. However I am so hungry seeing all your wonderful photos and instructions. I think I sneak out and buy some lamb and try your recipe he will become a fan. Great recipe and voting up and pinning in my favorite rccipes. This looks like a delicious dinner, and you make it look so easy! Delicious recipe, my friend. It sound delicious. I love lamb chops. I am glad you put another recipe to accompany the lamb shoulder chops. Just looking at the pictures makes me hungry. Thanks for share with us. Voted up and YUMMY!